Four performers embody all of the characters in The Secret Theatre and Ript Theater Company's fast-paced, non-stop whirlwind production of Shakespeare's classic tragedy. See it if you like Shakespeare with a little innovation. Don't see it if you want a four-hour play filled with all the trappings. Don't see it if you are a WS traditionalist. Language is supreme, but deep cuts to 90 mins. Whirling, fast-paced. Before you go, google plot/characters . 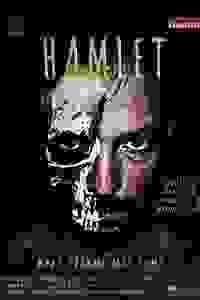 See it if You know Hamlet well, and are curious for a new take. Don't see it if You are not familiar with Hamlet. See it if you love Shakespeare, and love watching people who can explore it masterfully. And to watch actors brilliantly play multiple roles! Don't see it if you don't enjoy small casts, low budget, simple, pared down Shakespeare. It was about the text, the story, and the lives of these people. See it if you enjoy watching Shakespeare plays that are clear, innovative, and intense, and that are (on top of everything else) only 90 min long. See it if You love Shakespeare or you don’t like Shakespeare and are prepared to have your mind changed. Unlike any Shakespeare I’ve seen before. See it if You like surprising stagings of Shakespeare, and also like to understand what the actors are actually saying. See it if you are looking for an innovative, relationship-centric, fast-paced interpretation that stays faithful to the language. Don't see it if you think the uncut version of Hamlet is too short and has too few characters. See it if You'll enjoy a new examination of a classic work. Don't see it if If you are not familiar with Hamlet and following Shakespearian speech the changing characters could be confusing.